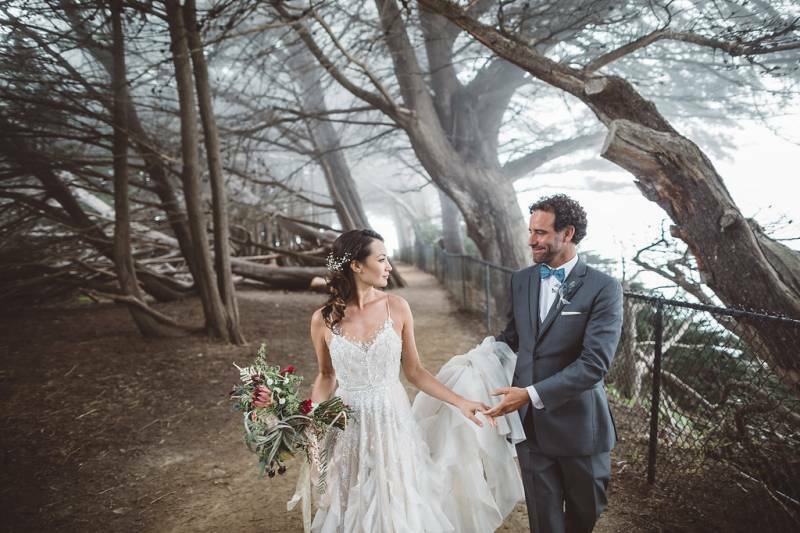 A beautiful boho Big Sur wedding at The Ragged Point Inn is all kinds of dreamy with a ceremony over looking the cliffs of the rugged California Coast and a reception under the cypress trees. From the soft florals, to brilliant blue tablecloths, and each creative detail in the decor, it exudes an ethereal look and feel. Studio 7 Photography captured each and every moment in exquisite detail of the happy day. 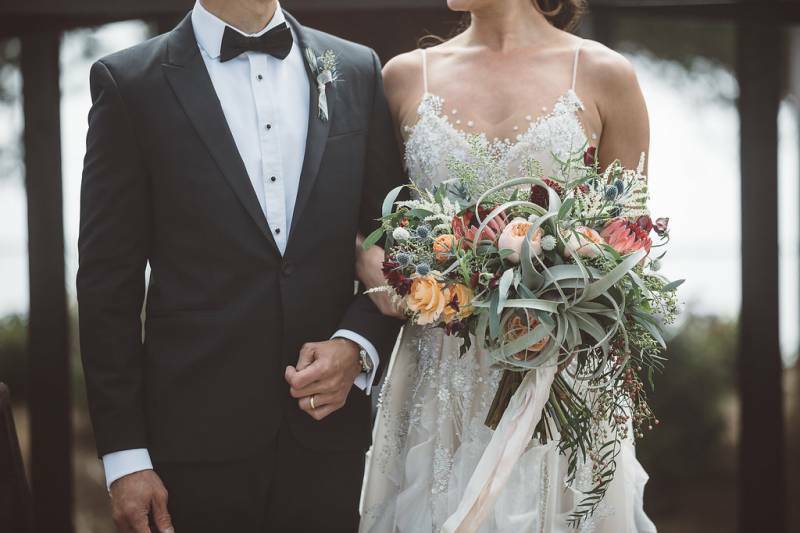 Words from the talented planner and designer, Samantha Josette: "For a couple that has experienced so much and that have traveled many corners of countries that most of us only dream about, their wedding day had to meet their global inspired expectations. A wedding that reflects their adventurous, creative, spontaneous personalities. Well, the wedding day definitely met those expectations and then some. Mike and Becca were mesmerizing to watch together. Their joy and love just spread like wildflowers." Becca and Mike's story began the moment they first laid eyes on each other...even though they wouldn't start dating until nearly a year later. They were introduced by Becca's then-roommate, Abbie and, over time, lucked into a few random encounters throughout the course of a few months. But while Mike was away in Hawaii for the winter of 2013/2014 for work, good 'ol Facebook kept them connected. And once Mike returned in the spring, they finally made plans to get together. The next winter she joined him back in Hawaii where their lust for travel, adventure and other similar interests continued to blossom. Upon returning to California, another twist of the universe saw them working hard, saving money and planning the trip of a lifetime. By October 2015, the couple set off with a one-way ticket to the Philippines and continued to travel through Asia visiting Nepal, Sri Lanka, Cambodia, Laos, Thailand, and Bali. This all-day-every-day time together allowed them to live in the moment, trust each other, overcome obstacles, work through problems and cherish every minute of each other's companionship. When they returned to America, the travel continued as they visited friends and relatives before scouring the entire California coastline looking for a new place to call home. In June 2016, they settled in beautiful Santa Barbara, California and both resumed somewhat "normal" lives once again. But that didn't last long as they quickly set off on a road trip to Utah and backed it up with a mid-winter Caribbean excursion to Barbados. But in the midst of all these new, exciting adventures, Mike secretly planned a proposal. He obtained his late grandmother's special diamond and put it in a custom, rose gold setting. And on a rainy Saturday in December, at a special place in Big Sur, Mike got down on one knee to surprise Becca with the promise of a lifetime. And as it always has, their love continues to grow stronger with each and every new day. "I always knew as a young girl that I wanted to say "I do" somewhere outside surrounded by nature and dancing under the stars. We choose Big Sur because it has always been a special place for us. A place where we can be free with no worries, living in the moment, surrounded by peace and beauty. Every time we leave Big Sur we feel a sensation of rebirth and rejuvenation so I guess our wedding style and theme was inspired by the majesty of the land and sea that Big Sur holds." "I chose a jade blue for our love for the ocean and the colors from the protea flower. Protea's were the first flowers Mike sent me from Africa in the beginning stages of us dating. I was so surprised to see the bouquet on my doorstep and had no idea they were from him! I have always been drawn to color and vibrant tones so I choose colors that expressed adventure, fun, freedom and excitement but rich in earth tones for a flowy bohemian vibe. I wanted a dreamy, whimsical feel which is where my vision of beautiful hanging Edison lights came from and I had the lights covered with eucalyptus greenery and flowers dangling over the head table". "I was excited to see my elaborate lighting and flowers come together. In the beginning everyone thought I was crazy with my vision but my amaznigly talented florist (Flowers by Kim) and rental company (Chic Event Rentals) did an amazing job pulling it off! But, I was the most excited to marry the man of my dreams surrounded by our closest family and friends in one of our most special places on earth, Big Sur!" Words from the designer and planner, Samantha Josette: "Becca had this vision for family style tables where her family and friends could break bread together. She described her want for edison bulbs to be dripping over the tables along with flowers and greenery. With the partnership of Chic Event Rentals and Flowers by Kim we were able to make that happen. Becca's love for nature's beauty provided such a majestic style. The flowers were incredibly put together using a color palette that picks up all the colors of the gemstones she has collected over her years of travel. Each guest was gifted a gemstone that was used as a place card weight as they walked in the reception lawn. The tables were draped with Jade colored velvet linens that gave this outdoor wedding some elegance and they were topped with eclectic clusters of flowers, wood, gems and modern gold geometric shapes that was so perfectly placed by Flowers by Kim. The stoneware settings from All About Events just continued their nature inspired theme. " "It is hard to choose one or two moments that were the most memorable as I felt like there was so much love in the air! But I guess walking down the aisle with my Dad and seeing Mike up there at the alter with the biggest smile and getting that indescribable excitement feeling inside of "Wow, I get to marry my best friend" was really special. Sharing our vows that we wrote to one another and kissing him for the first time as husband and wife was a really special and memorable moment with all of our family and friends cheering with happiness was pure bliss!" "All of our vendors were perfect and so fun to work with! Flowers by Kim in Paso Robles is hands down the best florist out there! She is so talented, patient, creative, professional and went above and beyond in creating the most beautiful flowers ever. I loved working with her! Kim and her team really brought my vision to light and I was blown away! Studio Seven Photography captured all our most special moments and even expressed them in a unique, artistic way. They are super friendly and easy to work with. Samantha Ward our wedding planner with Samantha Josette Eventswas all over the details and made sure that the little things that go along way were not missed. Chic Rentalsin Monterey and All About Events in Paso Robles really extended their expertise and suggestions which I so appreciated. Chic Rentals even came back the next day to double check on our lighting to make sure it was PERFECT! Our amazing videographers,The DeLauras from Laguna Beach captured our love story from beginning to end! The wedding video they created still makes us get goosebumps and brings us right back to our special day. And lastly our impressive, one-of-a-kind band that got the whole night grooving was Moonshiner Collective from San Luis Obispo! Dan Curcio and his band are so incredibly talented and we couldn't have been any happier to have him play at our wedding. They truly are the best! Anesha Rose with Music Mama jammed with them and sang a stunning, solo special song for us during the ceremony. All of our vendors were the best and so great to work with making the planning process less stressful and fun!" "Just enjoy every moment! There is so much out there but remember it's your day and everything will be perfect!" What the video by The Delauras of the beautiful day below! PrevFlying Caballos Barn Bash Venue Launch!